Tom has been working 60 hours weeks. He gets to the office early before sunrise. He returns home after dark. At mealtimes, he will be checking his phone for emails. During conversations and coffee talks, he periodically checks for social media updates. He seems to respond faster to electronic communications than face to face casual chats. Friends have been asking him to take time off, go for a short holiday, or just have some private family time away from the office. "What you need most is a vacation!" They say. Tom agrees. "Yes, I need a break." This is a common refrain from people who have been too busy, hopelessly fatigued, and totally maxed out. Despite their exhaustion, they still prod along with their holiday planning, hoping that they can find some breathing space to rest and to recuperate. They carve out a time on the calendar They choose a nice vacation place, a holiday resort, or a quiet retreat location. They arrange their travel plans and then set off with dwindling energy but high expectations. However, there is a problem. Studies have shown that holidays can be one of the biggest stress points. News agencies like Forbes even published an article on how to handle holiday stress. The reason is simple. Vacationing is about lifting ourselves out of familiar grounds into strange territories. For those traveling far, there is that time difference. There is the cultural difference. There are differences in ways things are normally done and most importantly, difference in expectations through local and foreign eyes. Ironically, while the intention of going away is good, the actual going away can be particularly stressful and can create more restlessness. Disobedience disconnects us from God's love. It sets us on our own wayward paths. It usurps God's rightful position as Guide. Derailed, we turn sideways as our own heavy loads become too much for us to bear. We try to balance ourselves with the latest and the greatest stuff. We run after things. We race one another to the finish line, conscious of the racing and not realizing the meaning for the race. We rush. We compete. We fight for the prize. Once we get the prize, we realize that the fun is in the hunting which ends when the target is captured. With every success, there is a feeling that winning is not everything. For success is not simply about achieving goals. It is achieving goals with our loved ones right there with us. For the Christian, rest is not about a physical condition. True rest always has a spiritual component. The story of Cain's banishment is a case of restlessness due to rebellion against God's way. Cain broke the sixth commandment. The punishment is heavy. Cain became a "restless wanderer." Like Cain, we too are creatures of restlessness. Restlessness is a heart condition. We can try to create an environment for resting but if the heart is not at peace, there is no rest. Like trying to stop a boiling kettle from spilling hot water, anyone trying to close the lid risks getting scalded. Like the proverb, we can bring a horse to the stream but we cannot force it to drink. Likewise, we can go on a holiday but that is no guarantee that we can be rested and renewed. I have attended many Christian camps both in the Summer or retreats toward the end of the year. In my earlier camps, I remember the organizers trying to maximize the time for everyone by squeezing in all kinds of programs and activities during the 3 days event. People started the day at 6am. Following a rushed breakfast, the teaching sessions were intense. Lunch was also a short one, followed by an afternoon of workshops and coffee. By 3pm, many campers were already exhausted. After a quick shower and dinner, the teaching session continues from 7.30pm until 10pm. The same thing happened for the next day. After the so called retreat, I remembered both organizers and campers saying: "I think I need another retreat after this retreat." When we try to do too much, we end up benefiting too little. We can bring our bodies to a retreat to try to rest, but we cannot easily tame the restlessness inside our hearts. Unless we come to Jesus. Restlessness as a heart condition must be dealt with by God, for God knows what goes on inside the heart. Jeremiah 17:10 tells us that: "I the LORD search the heart and examine the mind, to reward each person according to their conduct, according to what their deeds deserve." The late Dr Gerald May has spent more than twenty years listening to the inner longings of people and concludes that inside the hearts of people lies an "inborn desire for God." Unfortunately, people have either substituted or suppressed this desire. They also suppress their desire for God with anything. They suppress their desire for God with spiritually numbing activities. Thinking that they know best, they behave like they are the masters of their own destinies. They work harder. They invest smarter. They sink in their energies in the virtual or imaginary world of self-superiority. They enter into self-deception and in thinking that they know what they need, they unwittingly suppress their true need. There is another word for inner suppression. It is called repression. While suppression is a conscious, repression is something more subconscious, even unconscious. Gerald May traces this condition to unrequited passion or love. The sad thing is this. When we repress ourselves, we are only increasing our pent-up emotions. Thus, it is easy to trigger off a barrage of criticisms from all sides. It could be technological empowerment that makes it easy for people to speak up. It could be a rising intellectual climate. It could also be an increase of frustrations inside due to an increasingly stressful society. Hurt people will naturally cause hurt in other people. Unless we are well rested, we become unwitting fodder for more restlessness. "Devil! It is always the devil that's to blame. I say it is self-will." When Jesus asks us to go to Him, He is also asking us to include ourselves as part of the kitty. Do not simply give to Jesus our burdens, our problems, and our concerns. Give ourselves to Him as well. For until we are able to surrender our self-will to Him, we remain in charge of our own restlessness. Over time, restlessness becomes us. Self-will replaces God's will. True rest gets farther and farther away. I like what Tim Keller had said about true repentance. Legalistic remorse says: "I have broken God's law." True repentance says: "I have broken God's heart." That is precisely what spiritual awareness is all about. In the same light, I like to contrast restlessness and rest as follows. 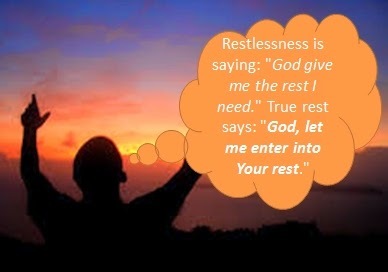 Restlessness is saying: "God give me the rest I need." True rest says: "God, let me enter into Your rest." Restlessness takes. Restlessness always sets aside something. Restlessness focuses on self. Restlessness is all about racing to the finish line. Restlessness is all about control and doing the right things. Restlessness trusts more in self. Rest gives. Rest gives all up for God. Rest focuses on Jesus. Rest is all about trusting that the grace of God will lead us home to Him. Rest is about surrendering and having the mind at peace regardless of activity. Restfulness trusts in God. Our hearts need a retreat. We need true freedom. We need true grace. We need Jesus. I remember my seminary Professor once said: "If you take a Sabbath regularly, you may not even need to take vacations." That is a profound thought. Indeed, a vacation is no guarantee of true rest. Only Jesus can give us true rest, with or without a holiday. We all need to let Jesus free us from ourselves. For when we are full of ourselves, there is no room for rest, only more restlessness. When we are full of Jesus, rest gets us.